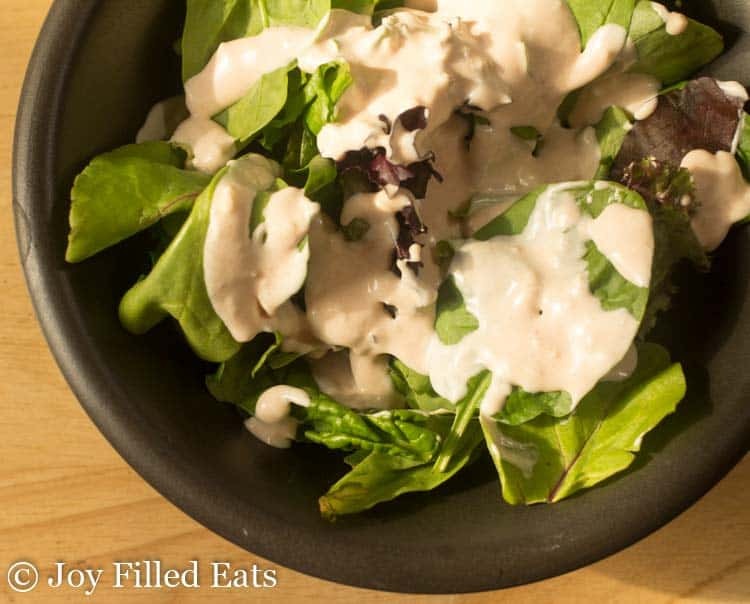 If you love garlic this Creamy Garlic Salad Dressing Recipe is for you. 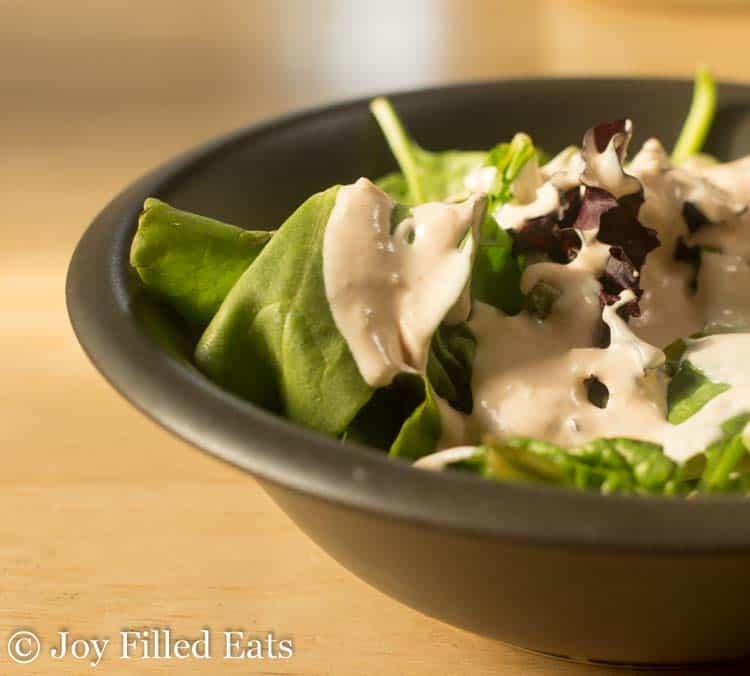 Just 5 ingredients and a few minutes to a delicious dairy-free salad dressing full of flavor. It is the perfect drizzle on top of mixed greens or fresh sliced tomatoes. 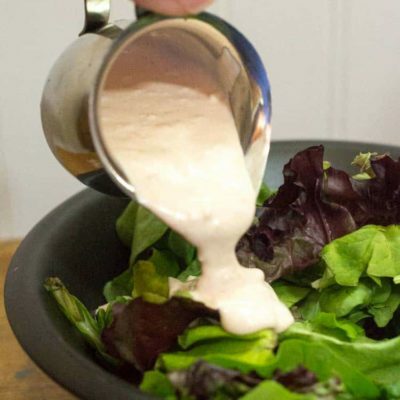 I love rich and creamy dressings. Ranch is my go-to for a garden salad all the time. But recently I’ve been limiting dairy to try and make the baby weight from my 10-month-old start to budge. As I’ve gotten older it’s harder and hard to lose weight after each baby. Cutting back on dairy does help the scale move faster for me. But I really miss all the creamy things in the world. 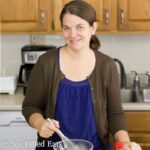 This summer many of the recipes I’ve been adding here at Joy Filled Eats are dairy-free. I have a whole dairy-free archive of them you can look through. 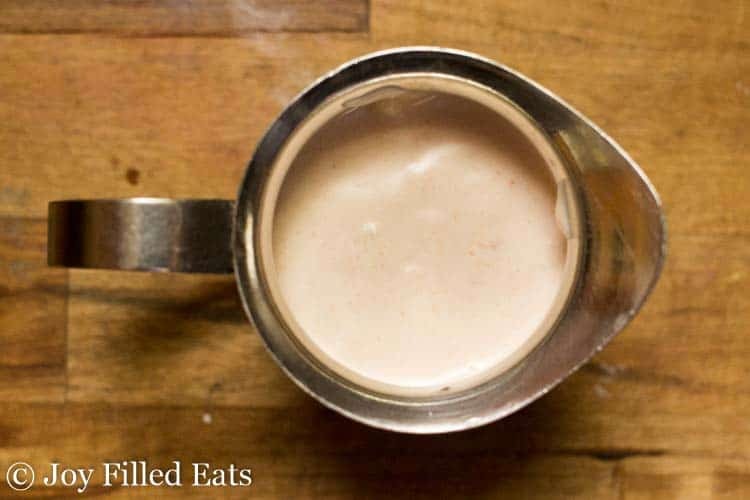 And this salad dressing recipe is among the best. You can’t even tell that it’s dairy-free. Am I the only one hears Emeril Lagasse’s voice by reading the word gaaahhrlic? 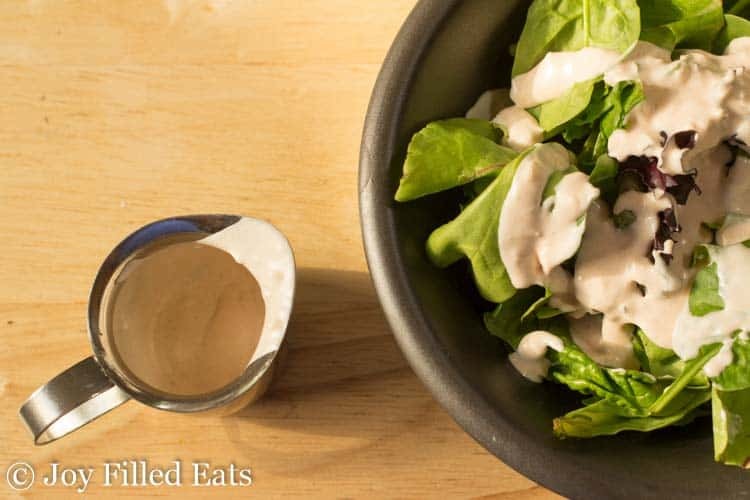 Every time I type creamy garlic dressing I hear Emeril saying it. Too many hours watching food shows on the tube I guess. Or it could be that I just need more sleep. My 10-month-old is still not sleeping through the night. The last couple of weeks my husband has been taking him more during the night which is a blessing but we still just hope and pray he starts sleeping better soon. Confession time. When I made this recipe for the first time I loved it so much I also tweaked it to make a roasted red pepper dip and a chicken zucchini casserole. You can do the same. It saves on dishes when you use the same ingredients for 3 recipes with just a tweak here or there. I’ll call that a successful day in the kitchen. As soon as I poured the dressing over these greens I stood barefoot in the kitchen and ate the whole thing. 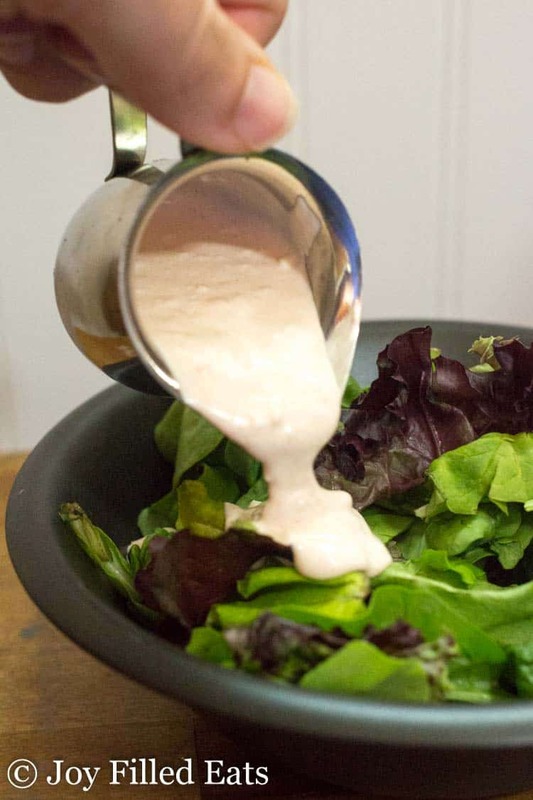 This Creamy Garlic Salad Dressing Recipe is so good you’ll be tempted to do the same thing. And, since it’s just salad, after all, I say go for it! Finely chop the garlic in a food processor or by hand. Mix with the rest of the ingredients. Store in the refrigerator. If 10 cloves of raw garlic sound intimidating to you-you may certainly use a lesser amount. Or roast the garlic first to mellow the flavor. We loved this as is. Is just as good if you use unsweetened coconut cream? I always use unsweetened. Coconut cream is different from cream of coconut. That is full of sugar and used for mixed drinks. Coconut cream is just the thick part of coconut milk. I just made this without altering a darn thing, and it was, by far, the best creamy garlic I’ve ever eaten. Can I say “yea” for Keto and “yea” for Joy,whomshared this! Thank you from the bottom of my creamy lovin’ heart! This sounds good but I am not a fan of coconut. Is there anything you would suggest as a substitute? Thanks! I would use more mayo and then thin it to your desired consistency with almond milk.